A little project I did late last night. This is what 2 1/2 hrs, 1 Styrofoam wreath, 358 Pine Cones & 79 Mini Glue sticks looks like. Yes I counted it all as I went, I'm OCD like that. I so love it thanks V & Co. for the tutorial :) And thank you Calie for helping me scrounge for the Pine Cones. Only a true friend would do that with ya! I'm dying to hang it from some fabric like V & Co but I have to figure out where to hang it first. So for now this is her temporary home. I also couldn't resist taking out my fabric pumpkins again this year. I love these so much and they are so easy to make. The tutorial I used to make them is from HOLLY BRIMHALL. This is another wreath I worked on last night, but it's still in the production phase. I plan to have it finished soon. This one is thanks to Eddie Ross. Oh I just LOVE it! I have all my supplies and needed a little motivation to do it and you've given it to me! The ornament one is fabulous too....added to my list! I love it!! Those are both gorgeous. Where in the world do you find 358 pinecones? oh my! you've been busy! and i want to make a wreath like your ornament one next! so cute, cute! That is a lot of pinecones! I love it! and I love your decorated shelves. So cute! I missed those tutorials - off to check them out! And you think I'M crafty?? That's a lot of pine cones lady!! lol It's beautiful!! 358? Holy crap! I love it though and only 2 1/2 hours, wow. It took me almost that to fill 23 plastic gloves with candy corn nails and popcorn for Halloween. I love it Rachel! I have a bit of a love affair with pinecones! I'm going to make a bulb one too! Hey can you show me how to make the fabric pumpkins you made? they are so awesome. Thanks for your help! I did it! Now, I'm just trying to figure out how to change the font on the blog titles and stuff like that. I want to make my page more personalized. I do think it's ironic how we know lots of the same people, but I don't think we've ever met. :) Too funny. I'm glad we're blog friends! Oh so pretty and fun! I love the pinecone one. You did a beautiful job!! so cute...and so pretty at the same time! Can I just say FABULOUS! AMAZING! Wow, I want one. I saw V and Co's and now yours! I am in love. You have amazing decorator style too. I love your whole shelving area. I want to do one of these christmas ball ones too. fun fun fun!! ok me once again. I am sure I get lost in the many posts because you are so dang popular!!! Well Addison is so cute I can't believe she is 2 that ia crazy and thanks for sharing your canning story that is awesome I can't believe you have canned so much! Had you done much canning before, maybe there is hope for me. I've seen my mom do and helped a lot but have only done a little myslef. 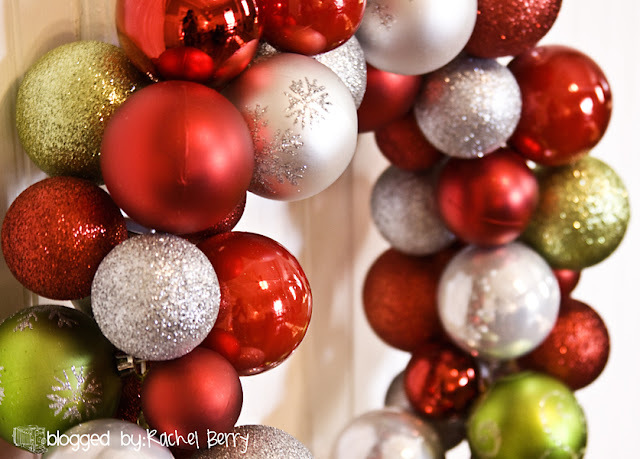 Fabulous wreaths. These projects do take a lot of glue don't they. Happy birthday to your darling daughter too. They grow up fast don't they. Thanks for your kind words on my photos. Please e-mail me and I'll be glad to help w/anything that I know---which prob. isn't much. For editing I just play around until something looks right. I think your photos are awesome. You are very creative-that makes it fun. I esp. love that you are always able to take such well-lit indoor photos. Do you use lights or do you just know how to adjust your settings properly. My indoor photos are terrible. LOVE the pine cone wreath. We have a billion here, I could probably talk my mom or sister into collecting them with me. The Christmas ball one has been on my to do list for a week. Did you use plastic ones? I was planning on heading over to the Dollar Tree and getting them there. Is it pretty easy to put together? Thank you for sending the font. LOVE it. This is awesome! I had to laugh, we live in S. Calif. near the mountains and found some hugomongous pinecones...and I asked hubby if they would cause a flat tire...they were huge! Right then he drove over one and our tire popped and went flat right then and there! hahahaha.....love your wreath. What a great blog you have too! Oh I am sooo dazzled! cute cute cute!!! I'm thinking it's time to take a trip to the woods. Your hutch is adorable and the wreath is a marvelous addition! I LOVE the ornament one too! Thanks for the great ideas and tutorial links! La-la-la-love your pinecone wreath!! It is fab!! I'm thinkin' I NEED one. Great for fall and Christmas, for me anyway. 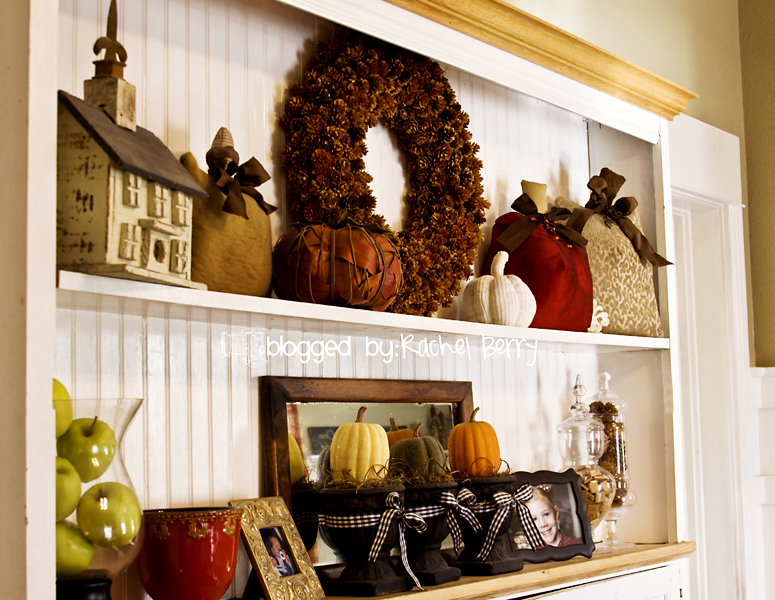 ♥ I love the the ornament wreath!!! 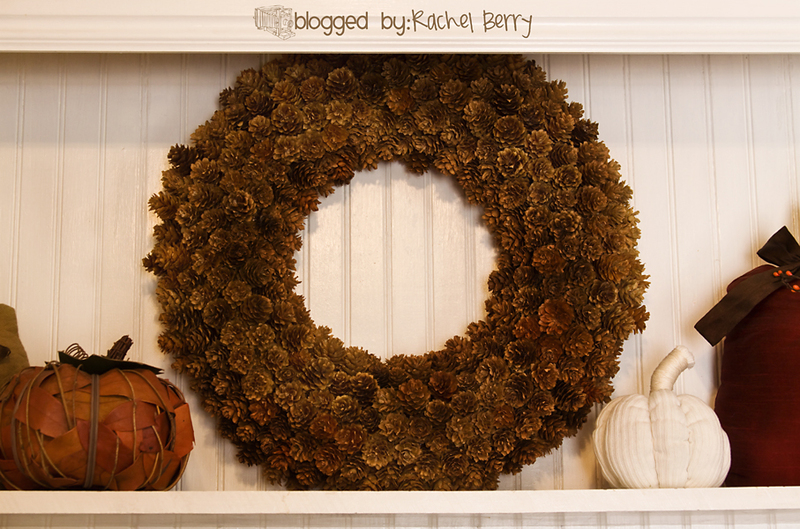 Love your pinecone wreath! I saw the same tutorial and knew I had to make one. We headed up the mountain, and to my disbelief, we could not find a single pinecone. Not one! Not on the ground, not on a tree. It was the strangest thing I've ever seen. I guess I'll have to try again next year. The pinecone wreath looks great! I think I might do the ornament one. I hope you are feeling better! Yes, little Man has a cough (but Dr.'s say he is ok) but he coughs so much he vomits, poor child. On another note, after seeing these I think I may have to invest on a glue gun, you think? Rachel that wreath turned out fabulous! I am so glad we got to share that moment of pinecone bliss! Memories that last a lifetime baby! Good times! So the balls are glued together on a wire hanger?